I am very excited to share with you all my first juicing recipe. I’ve had a juicer for months but for some reason none of my little juicing recipes have made it to my blog, until today. 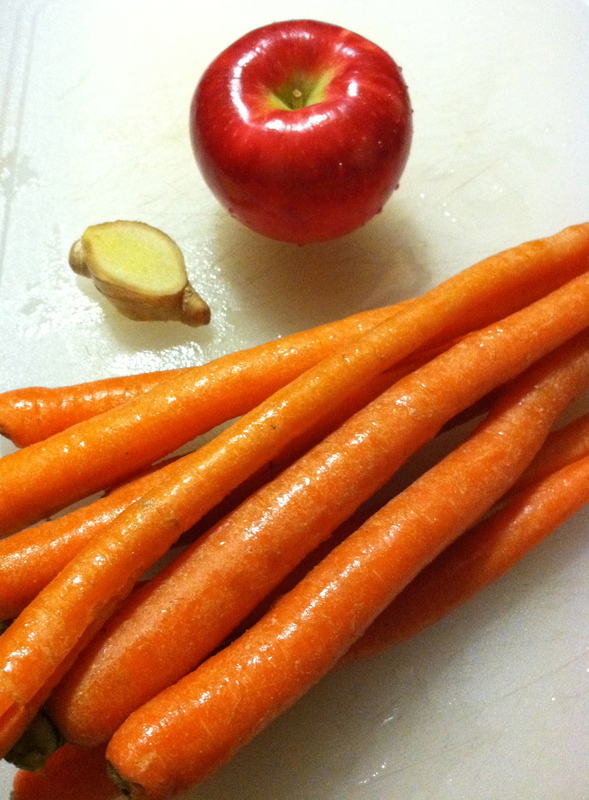 So for all you fellow juicers out there, I am going to share with you my favorite juice, a carrot apple ginger juice. This recipe for carrot apple ginger juice makes me two servings. I have one 3/4 cup serving as a mid morning snack and the other 3/4 cup serving as a mid afternoon snack. If you would prefer, you can easily make this recipe for one serving. For example, you could have the one serving, a 1 and a 1/2 cup serving, of juice as your breakfast with a piece of whole wheat toast with hummus. Wash your carrots and cut off the tops and ends. Cut your carrots into smaller pieces. Then wash your apple and cut into small chunks that your juicer can handle. Cut off a piece of your fresh ginger root. I usually cut a small piece about a half inch by a half inch in size. Cut off the outside of the root, leaving you with just a small amount of fresh ginger. Now juice your carrots, apples and ginger root. I personally try to juice a piece of carrot and then a piece of apple alternatively so the flavors begin to mix already as your are juicing these. Also, I’d like to point out that I usually try to make sure the ginger root does not get juiced last. I think it gets juiced better when it is followed by either a carrot or an apple. Keep this in mind so that you ensure you get the full flavors of the fruits and vegetables in your finished juice. 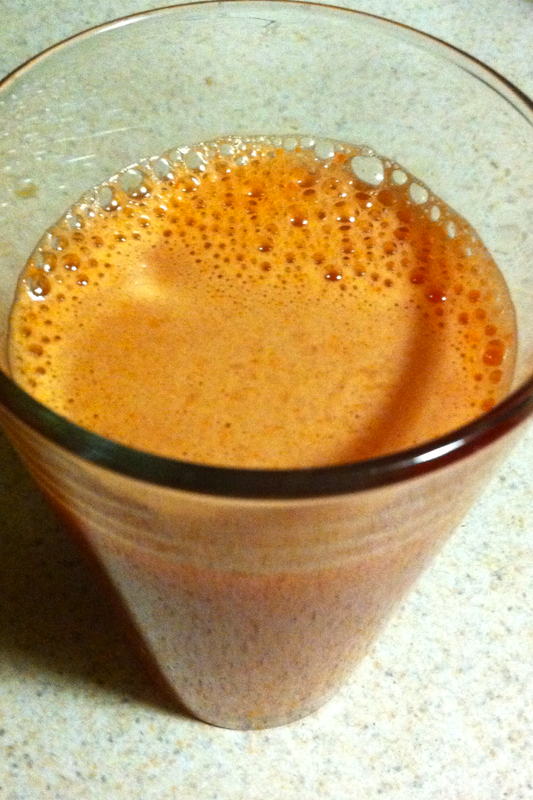 This carrot, apple, ginger juice is highly nutritious, extremely low in fat, and delicious! One serving contains 155 calories, over 950 milligrams of potassium, and almost ten grams of dietary fiber. This juice also full of vitamins and minerals. Some to point out are vitamin A (661% of daily intake), vitamin B-6 (20%), vitamin C (33%), vitamin E (7.4%). Fruits and vegetables are a very important part of your everyday diet to stay healthy. Forks over Knives points this out as do multiple studies. These studies continue to be done on how fruits and vegetables in your everyday diet work to increase cardiovascular health and put you at a low risk or developing cancer. Anyways, all of this is just another reason to enjoy your carrot, apple, ginger juice. Once you’ve juiced your carrots, apple and ginger root, stir your juice and pour into a glass. Enjoy and stay healthy!